I hope you all had a safe, enjoyable New Year’s Eve celebration. 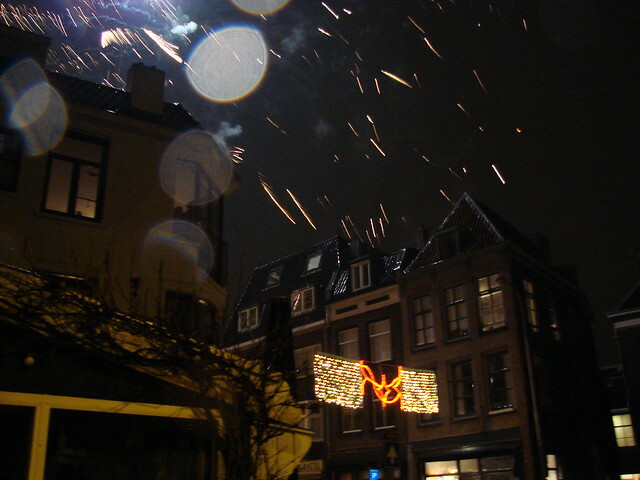 As is the Dutch tradition, fireworks and firecrackers were going off all day yesterday and at midnight the real show began. 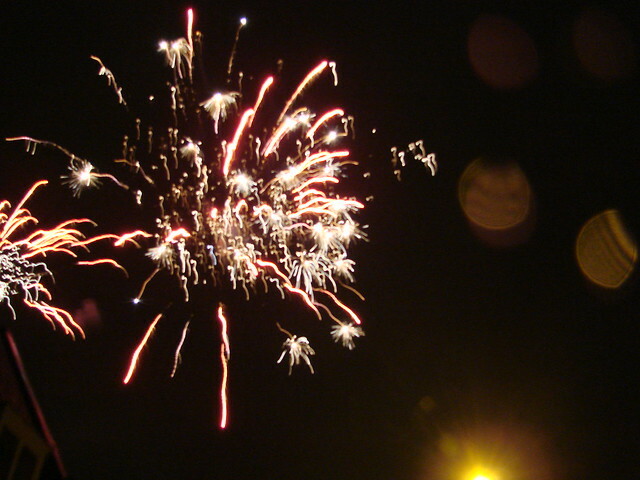 We went out to enjoy some of the displays. It’s all amateur fireworks, rather than official programs, which makes it all even more impressive at times. 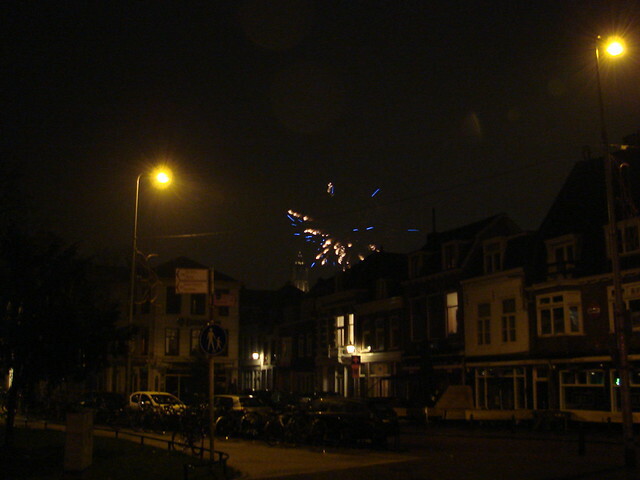 That’s the Domtoren in the center distance, next to the fireworks. Next is a group of guys preparing to set off a long string of firecrackers. Video of the actual firecrackers follows. Check your volume first! And this is a video to give you an idea of how loud and crazy it can all be. One seemed to go a bit wayward, which is what lead to a bit of the wobbly camera and lots of laughing afterward. The Light-UP Collective is a group of artists here in Utrecht — including L-Tuziasm — who do fascinating things with light and projections. Essentially, they draw with light, using tablets, beamers, and their own in-house software fantastically named Happytron. Large or small, their projects aren’t just limited to the artists of the collective. They often have audience members get involved, as well. 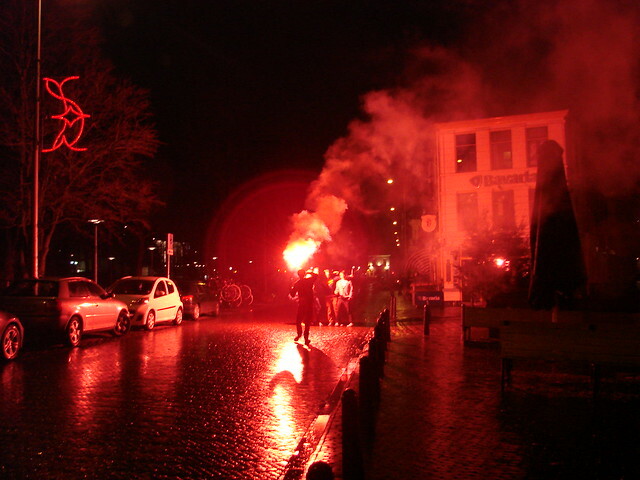 Nor is their work limited to Utrecht, they are involved in events all over the country. 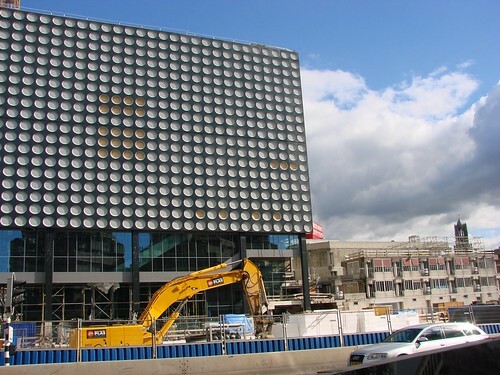 However, it seems they did do some work here in Utrecht recently. Specifically, they took a trip to the Rietveld-Schröder House to work their light magic on the famous home. Have a look! I’ve got a few more days left in the US, and you’ll probably end up seeing a few more posts about the US when I get back, but for now, time to squeeze in one last post about the 300th anniversary of the Treaty of Utrecht (Vrede van Utrecht). Unfortunately, I missed the final celebrations, but I got to enjoy plenty of the events that have taken place throughout the year. This video is a nice look back at some of the many events and exhibits, including some of the ones I didn’t make it to over the past few months. Enjoy! At various points over the years, I’ve seen and heard references to the film Amsterdamned, a 1988 Dutch horror film focused on the canals of Amsterdam. The reason why I’ve heard about the film is because of a famous boat chase. Two speed boats — one with the masked killer and the other with the investigating police officer — race through the city’s many canals, doing their best to avoid numerous obstacles. At one point, a tour boat is blocking the whole canal and the boats veer onto the wharf in order to avoid the tour boat, scattering people sitting at tables next to the canal. Wait a minute! Amsterdam canals don’t have those kind of wharves! Although the boat chase does go on for quite a while, it doesn’t go on long enough for them to have suddenly appeared in Utrecht’s Oudegracht! Yet that’s exactly where they are! 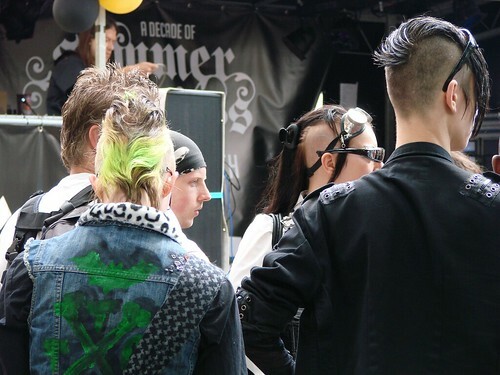 Then, just a few moments later, they’re back in Amsterdam. You see, the Oudegracht and Nieuwegracht canals here in Utrecht, with their water-side wharves below the regular street level, are pretty much unique to Utrecht. 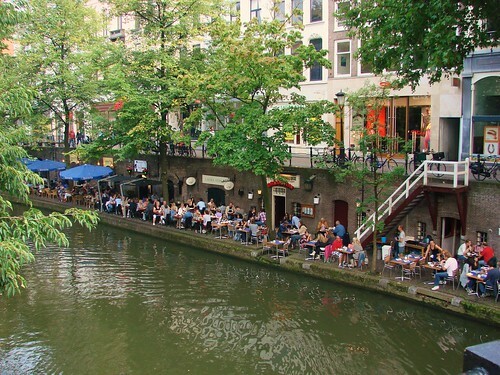 Amsterdam has nothing like them, despite the many canals. In order to create an eye-catching stunt for the boat race, they decided to make use of Utrecht’s canal, location be damned! This is why I’ve come to know of this film. 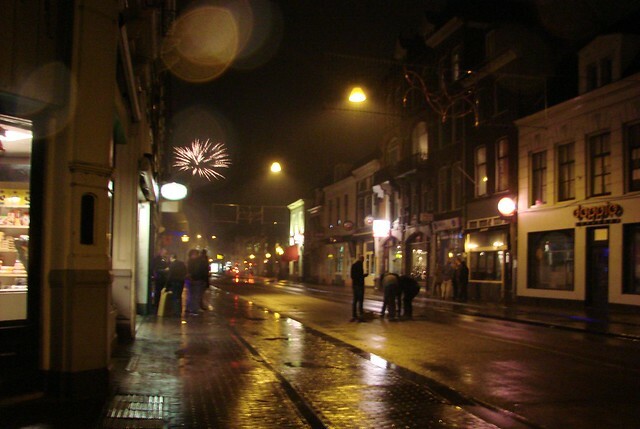 This 30-second location blip is fairly well-known to Utrechters. Despite knowing about it, I had yet to see the film or even the boat race, until yesterday. I came across a video about the filming of the stunt in Utrecht, and then finally found a video of the boat race itself. You can see it for yourself. Utrecht shows up at about the 5:30 mark and is gone again by about the 6 minute mark, so keep your eyes open! Because I seem to be incapable of going out without passing through the Domplein, we were lucky enough to come across a performance by the Fanfarekorps Der Genie (Engineers Regiment Fanfare Corps) on Sunday afternoon. 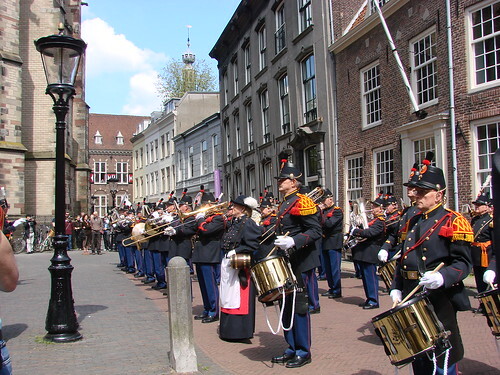 We had just begun to approach Achter De Dom when we suddenly heard the sound of drums. There, behind the cathedral, they began to perform and we raced up to get a good view and listen. 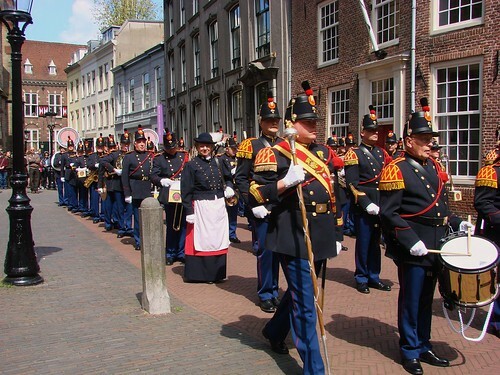 In 1888 the Royal Dutch Army Engineers Regiment Music Corps was first formed by NCOs and volunteer soldiers in the city of Utrecht. 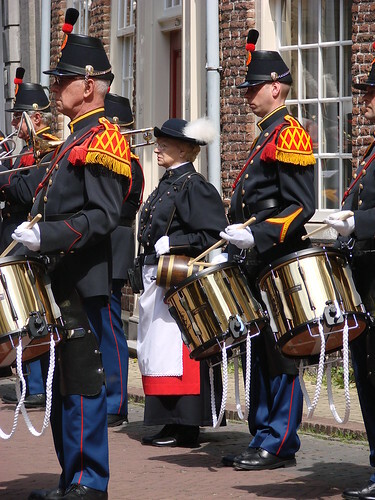 Now, 118 years later, volunteers from the Engineers Regiment again uphold the musical tradition of the Engineers Regiment (1748 – 2006). Due to a re-organization within the defense department, the “Engineers Regiment Fanfare Corps” was disbanded. At the beginning of 1997 the idea occurred to breathe new life into the “extinct” music corps. After discussions with the headquarters of the Engineers Regiment Corps, we started to correspond with almost all of those earlier recruits of the Engineers Regiment Fanfare Corps. 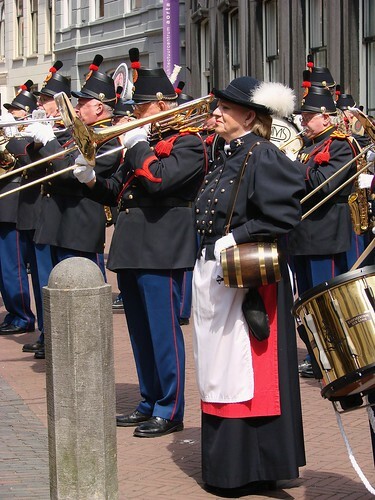 Presently, the band consists of 50-65 musicians, all dressed in the historical 1888 uniform. As we were watching, we couldn’t help noticing two women in their ranks with small casks. 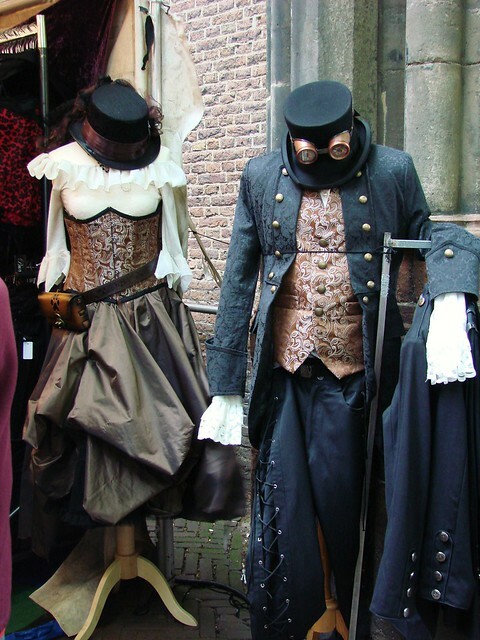 It seems that it is a tradition that a small tot of brandy be poured from the cask carried on shoulder straps by the serving girls. Special guests are now usually the recipients of the glass of brandy. The group also sells special bottles of the brandy to help raise money for uniform maintenance. Finally, here’s a brief bit of the drummers performing. 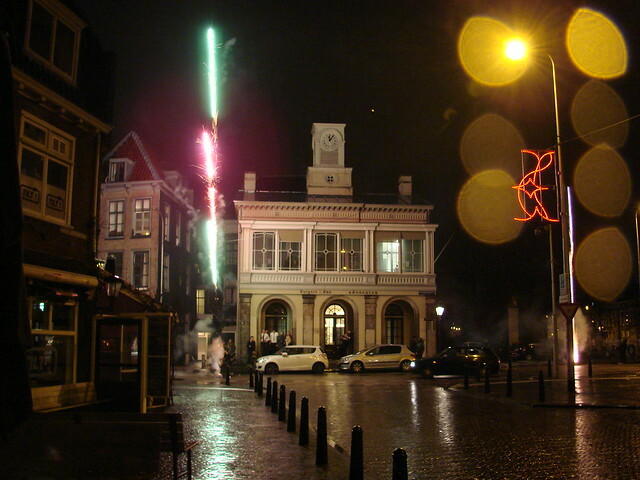 Despite the light rain, Pippo and I went for a quick walk through a bit of town today, including a stop at the Domplein. As we approached, we could hear music and eventually located the source. 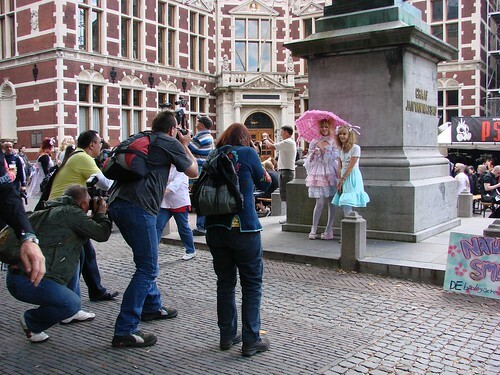 It was a trio of street performers playing beneath the Domtoren. Not exactly the typical tunes you hear on the street when an accordion is involved, but absolutely perfect for the setting! Since we moved here, the western end of town has seen constant construction due to the renovation/rebuilding of the Vredenburg Music Hall. The building was originally constructed in 1979 and has hosted a variety of concerts and musical events, but it was becoming a bit shabby and too small, so a new music palace is under construction. Two of the main halls of the original building remain, but they have been encased in a larger, more opulent structure. 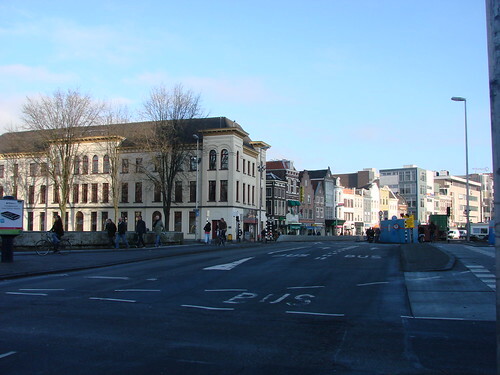 The rebuilding is just one part of the CU2030 revitalization project that is part of a major reworking of that whole side of town, including the music hall, the Hoog Catharijne shopping center, the train station, and the highway that’s being turned back into a canal. In other words, it’s all a big, ugly mess these days. There’s a large square behind the music hall, which is where the local market is held on Wednesday, Friday and Saturday. That’s the part I usually see, but I’ve been seeing other parts of it in the past couple of weeks as I’ve headed to the train station a few times. While heading home one day, I snapped a couple of shots of the new façade of the building, with the Domtoren off in the distance on the right. I’m not sure how I feel about the new building. It’s not that it’s modern in design; I think my hesitancy stems mainly from the fact that the whole area is still under construction, so it’s hard to not think of it all as cramped and busy. I’m sure once the work is completed on the whole area — including reopening the canal where the car in the top photo is — it will feel more open and clean and balanced. The plans for the area, which can be seen on the CU2030 website (in Dutch and English) do look appealing and certainly nicer than what we’ve got now! I still worry that the older buildings across the street (seen above) will be overshadowed by this new music palace, but I’ll reserve judgement until it’s all finished. Amusingly, another palace of sorts once stood on roughly the same ground. The Vredenburg Castle, although short-lived, was constructed in that area in 1532. You can read more about it, including how Trijn and a group of women tore it down, at the castle’s Wikipedia page. For what it’s worth, here’s a time-lapse video of the spot taken on the same day I took my photo. There are also live webcams available on the CU2030 website. You can get a better sense of how the new structure seems to tower over the nearby buildings. Usually I don’t bother with words on Wednesday, and I don’t honestly have many for today. Just a few to explain that these are a few of the photos I took Sunday at the Summer Darkness events taking place at the Domplein. 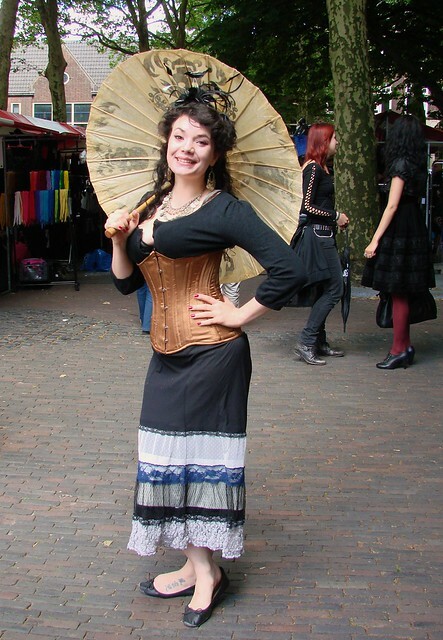 There was a market set up — where I found some great boots — as well as fashion shows taking place throughout the day. I was there relatively early, so I didn’t get the same selection of photos as in the past. 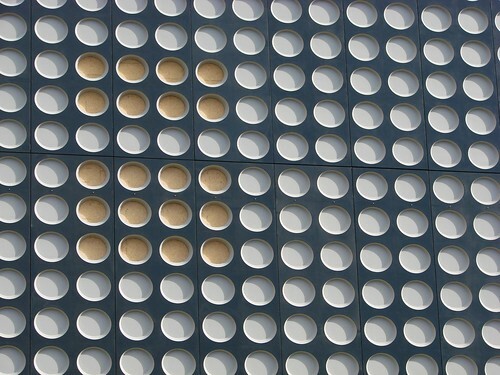 Plus, the Pandhof was closed, which is usually a great spot for photos. After my photos, check out the video at the end of the post. 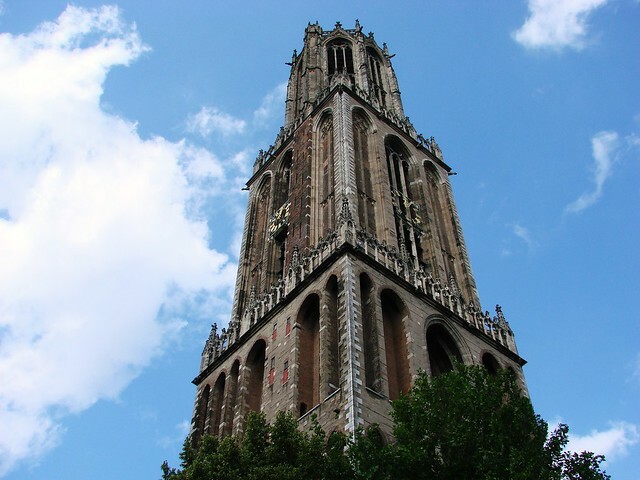 It’s a short piece showing the Domtoren carillon player performing Depeche Mode’s “Enjoy the Silence”, one of three pieces specially performed to celebrate Summer Darkness’ 10th anniversary.